Tim has worked for AXA PPP for the past 13 years. He's currently a Customer Service Contact Centre Manager in Tunbridge Wells. But it could all have been so different as in a previous life he was part of a stand-up comedy double act performing in Brighton. 'Stopps & Schatz' never quite took off so Tim joined AXA instead. 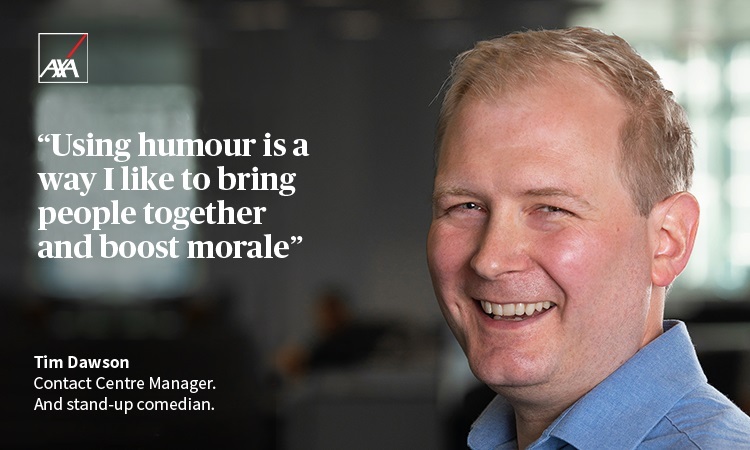 However, he soon realised that his sense of humour, ability to laugh at himself and not take life too seriously could be an asset in his career with AXA. Fortunately, his bosses agreed and it has helped him thrive and achieve what he has to date. Whether it’s having his legs waxed for charity or agreeing to wear an inflatable turkey costume for the staff Christmas party Tim's belief is that humour is a great leveller and a brilliant way to engage people. It’s meant that junior colleagues have not been afraid to approach him with innovative ideas for doing things differently such as rewording confusing claims forms or better ways of managing local workloads. Whenever possible he also tries to incorporate humour into any form of communication as it helps to keep the recipients engaged, wanting to read on and ensures the information is passed on. Ultimately brilliant customer service begins with happy and engaged employees and Tim's sense of fun and creativity boosts morale and has helped his colleagues maintain this in the often very challenging and pressurised atmosphere of our customer contact centres. As he has a direct role in recruiting new members of the contact centre teams (both personal advisors and managers) he is helping to ensure AXA PPPs future continued success by making sure we employ the right people who understand and share our company values of integrity and have the desire to deliver the kind of service we want for our members. As for Tim’s comedy partner he’s kept in touch and they are currently working on various scripts and waiting for the call from Hollywood…or the Brighton Comedy Club. Interested in finding out more about life at AXA? Read more of our #WeAreAXA people stories here.